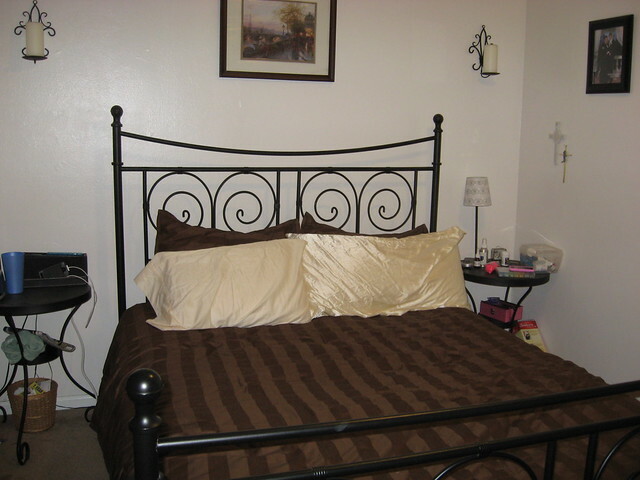 When we moved into our first place, I wanted to do a Moulin Rouge/Paris type theme in the bedroom. I couldn’t really do pink, so a nice compromise was red. We got our bed and bedding all from IKEA because at the time that was all we could afford. From the very beginning Joshua was not a fan of duvet covers. He’s a comforter kind of guy. 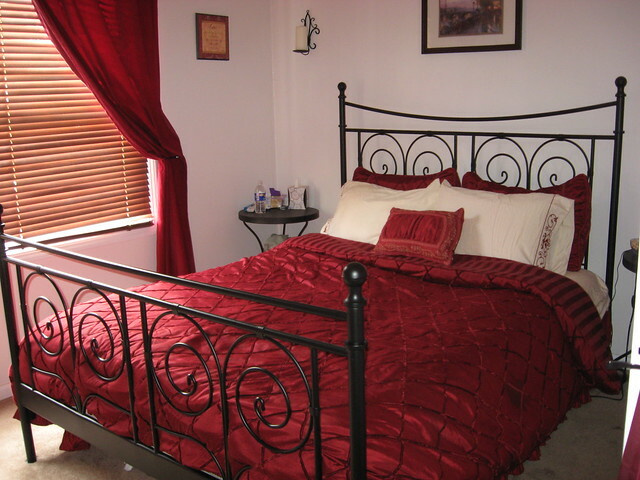 Plus the red cotton easily showed the cat hair that came from having two cats that like to sleep on the bed. I kept my eyes peeled for a new comforter set that would match our theme. That’s where this bed-in-a-bag came in from Bed, Bath and Beyond. This was nice at first, but when it came time to wash it, it was a pain. For one it had to be dry cleaned, meaning I had to invest in Dryel sheets. Because it’s a queen comforter it was, for the most part, too big for the dryer so it never got fully cleaned. The material, whatever it was, tugged on Joshua’s dry skin, so it wasn’t exactly comfortable for him. Between the cat hair and being difficult to wash, we donated it and got a simple cotton comforter from Wal-Mart to tie us over till we moved. When we moved into our second place we abandoned the Moulin Rouge theme and went for a more airy, relaxing theme. 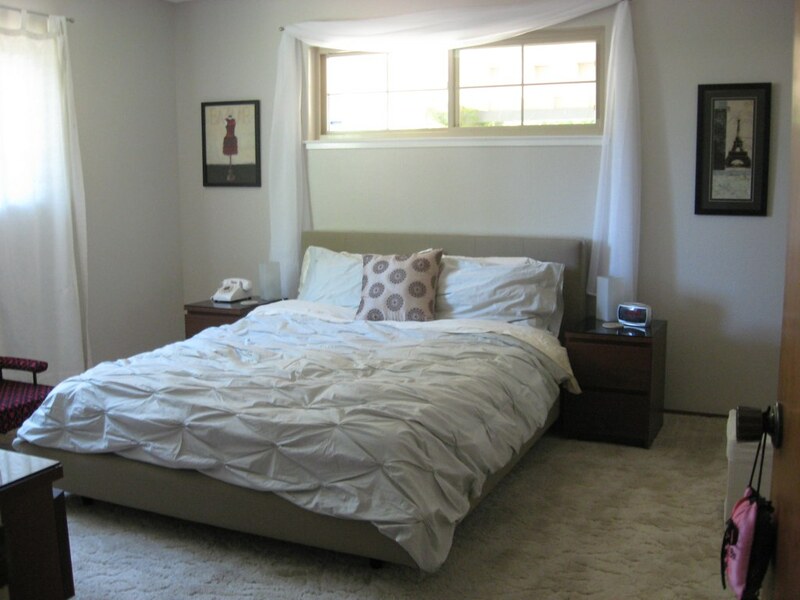 We got a new bed from Crate & Barrel, which proved to be a million times more comfy than the NORESUND frame from IKEA. I immediately fell in love with West Elm’s Organic Cotton Pintuck Duvet Cover. Joshua wasn’t a big fan because it was a duvet, but it was cotton, which he definitely wanted. My case for this was until I get a front-load washer and dryer, we’d be doing duvet covers. This was perfect until we noticed some bleach-like stains appearing randomly, especially in the areas near the head of the bed. It wasn’t long before I realized it was the benzoyl peroxide from my acne medication causing these stains. I talked to a sales lady at West Elm who said she had the same problem because she uses Proactiv. I couldn’t exchange the bedding, so I was stuck with a stained duvet cover and pillow cases. Eventually our duvet cover looked nothing like it did when we first got it, so once more I was on the look-out for new bedding. 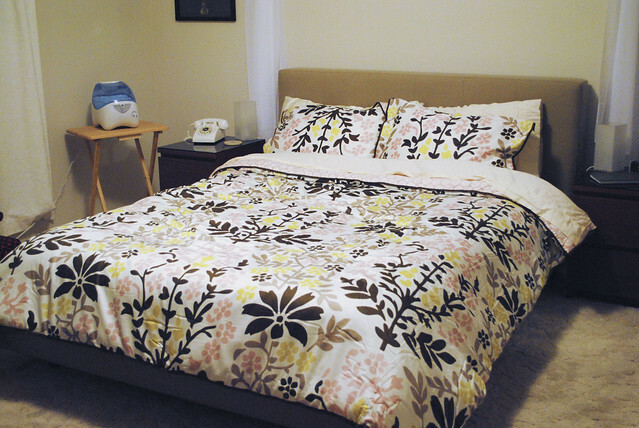 I was pretty bummed because I really liked the West Elm duvet cover! I just hated how easily it stained and faded. I ended up finding this comforter set at Target. I liked the colors of it on the shelf, but I never could get used it to in the bedroom. I initially had the bedroom set up to go with some kind of blue bedding, so while the pink/yellow was cute, it never really went with anything else in the bedroom. I managed to return it, and after seeing a super-cute new duvet cover in West Elm’s catalog, I decided to give them one more chance with their Organic Seedling Duvet Cover + Shams. Once again we had the same problems we had with the first duvet, even though I no longer wore benzoyl peroxide at night and was careful not to touch the bed once I put my acne cream on in the morning. Despite my efforts a few stains came back. Also my cats chewed off a couple of the buttons holding the duvet insert in. Honestly, the bedding seemed cheap, and overall I’m actually disappointed in the quality of West Elm’s bedding. Almost every time I go to Target I was taking a trip down the bedding/home décor section. I noticed they updated their style of bedding, and I decided to give this one by Dwell Studio a try. Normally this is something I wouldn’t consider because it’s mainly white, and if you’ve seen the guestroom bedding you’ll know it EASILY shows cat hair! However, in addition to new bedding, I decided to give something else a try: the Pledge™ Fabric Sweeper for Pet Hair. This thing is amazing! It is so easy to get pet off of everything! 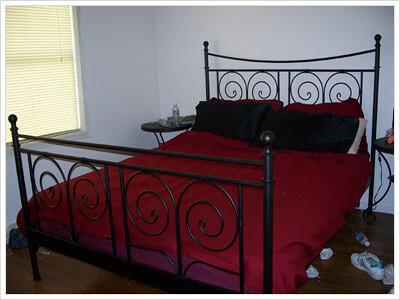 I use it on the bed frame, the beds, and even on our living room furniture. Because of this bad boy I don’t anticipate getting rid of our bedding anytime soon! Looks great Cristina! I used to have the same problem with my acne meds so I just kept the same ugly old comforter for 8+ years. Now I switched to harsher meds that don’t bleach, so I finally got a new comforter set. My doctor always suggested putting the cream on an hour before bedtime to let it fully soak in and then washing hands with soap & water, but I don’t want to take my chances. Let me know if you ever find a cure for this bleaching problem! Two words: Matteo linen. Still broke from them ( ok not really) but they are deff splurge and so worth it! Also both target and West Elm ( one of my fave stores) have great organic sheets, which wash and wear fantastically. I would say I prefer the Tar-jay variety; however I do love West Elms rich colors. 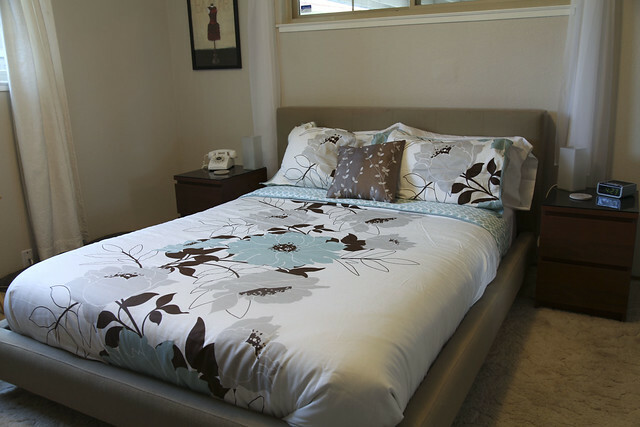 But the tie it all together the Matteo duvet is a little slice of a-dollar- a- day heaven!